When it comes to landing a top spot in search engine results, the world's leading 200 consumer brands can't be beat. But within the search pages on social media sites, a study out this week shows that the biggest brands often barely register. Nearly 100 percent of top 200 Fortune 500 brands are either at bat or in the batter’s box when it comes to search ranking, according to a new report from BrightEdge, a San Mateo, Calif., software development firm. However, 70 percent of those brands didn't have Facebook or Twitter pages in the top 20 results, says BrightEdge. Brands regularly pour vast resources into social media, but they're not making the most of it, says Jim Yu, CEO of BrightEdge. "Brands may be missing critical customer connection points if consumers can’t easily discover their social media pages in search." Indeed, no matter how engaging your Facebook page might be, if a consumer can't see your link in the top 10 search results, that link might as well not exist. At the risk of sounding Zen-like, this seems like a case of the proverbial tree falling in the woods when no one is around. Does it make a sound? Looking at the results from the big boys, you may be wondering what you can do -- right now -- to beef up your brand’s social media presence? For starters, link to your Facebook page from your business website. 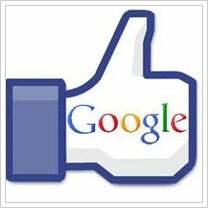 Conversely, link to your website from your Facebook page to increase the search rank for your Facebook page. Your page’s administrator can do this from the website field, accessible via the “Edit Page” button at the top right of your Facebook Page. What's more, keep your Facebook page fresh with updates and relevant new content. Although the BrightEdge study found that there is no correlation between the number of "friends" or "followers" and landing a top spot in a Facebook or Twitter search, new content does entice readers to like, link and share your content with others. That, in turn, could increase the likelihood that your page will rank higher in search results. And because Google and Bing now include “social” signals in their search algorithms, it’s more important than ever that your content be spot on. How else do you explain Nike's Facebook ranking? The athletic shoemaker has more than 4 million Facebook fans, yet its Facebook page fails to rank in the top 25 search results for “Nike.” Why? It could be because its Facebook page has only been updated 14 times since the first of the year. How does your business rank on Facebook and Twitter? Let us know what you do to optimize your search results.